By the Mountain Bound is a remarkable novel. It is a prequel to All the Windwracked Stars, but it is a prequel that does not simply tell of events that came before, it is a prequel that makes the events of All the Windwracked Stars all the richer and more powerful. During the early chapters of All the Windwracked Stars we see that Muire is the lone survivor of a war that claimed the waelcryge and from which she ran. We see her alone in the snow at the end of the world. We are told of a war that was faught and that so many of the waelcryge, warriors of Light, were Tarnished. We learned that the Tarnishing of their power, of their light was of far greater significance than is conveyed in the first novel. In By the Mountain Bound readers are shown the loss and the power in the word “tarnished” that is never quite captured in All the Windwracked Stars. This is the story of what happened before the fall. For a moment, though, Elizabeth Bear makes the reader forget that we know how this all ends. Bear gives us three viewpoint characters: Muire, Mingan, and Strifbjorn. Readers know Muire from AtWS, but though Mingan is an important part of AtWS, here he is brought to life in a very unexpected manner. The depth to his character is surprising (though not surprising given the author), as is his more sympathetic nature. Here Mingan is a much more developed character compared to the somewhat sinister character he was in the background of All the Windwracked Stars. Even Muire, though, is different here. For a member of the warrior class, Muire is comparatively meek and quiet. She is the historian. Muire is a different character here than in All the Windwracked Stars. She’d have to be. She has not yet gone through the end of her world. 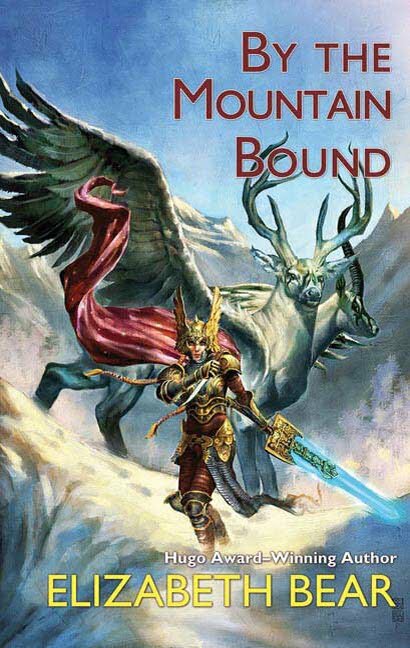 Strifbjorn is the, comparatively, new character in By the Mountain Bound. Strifbjorn is the war chief of the waelcryge, the immortal children of the light, and it is he who finds the woman who is neither mortal nor waelcryge. This beginning of the end of the world. There are no stock characters here (or in anything Elizabeth Bear writes). Each character comes across as real and layered. Even the minor characters who are given names but do not have anything to do in the novel have a sense of solidity, as if only they were given a voice we would see that their motives and desires were as strong as those of the main characters. This is something which Bear does especially well. Her characters are not just waiting offstage for the chance to step into the spotlight, they each have their lives and sometimes we get to see what they are. By the Mountain Bound also opens up all sorts of questions and new ways to read All the Windwracked Stars, except to even mention what those questions are would be to spoil part of By the Mountain Bound. It is a rare novel that makes the preceding novel so much richer and opens up new avenues for Elizabeth Bear to explore in The Sea Thy Mistress. By the Mountain Bound is a rich and beautiful novel. It stands as one of Elizabeth Bear’s best, and that is high praise indeed. Reading copy provided courtesy of Tor Books. I've only recently become aware of Elizabeth Bear via her short stories. After finishing The Chains that you Refuse, I'll definitely be looking into these two books as well. Don't forget her Promethean Age novels! I think that's probably her best work. Enjoyed Ms. Bear's scifi Jacob's ladder trilogy so thought I'd give this a go. My 1st foray into fantasy & it was completely engrossing. Fast paced, page turners... Fun & quick reads. Read the trilogy starting with this book 1st... Sad it was over so soon. Still not a fantasy fan, but I will definitely read Ms. Bear again.